Making pasta at home sure has changed a lot, just during my lifetime. For centuries, Italian women took a mound of flour, made a volcano-like cavity in its center, added a few eggs or some water, and slowly started combining the 2 ingredients. Eventually, a ball of dough would be formed, which they would knead before setting it aside to rest. (Let’s be clear: it’s the dough that rested.) 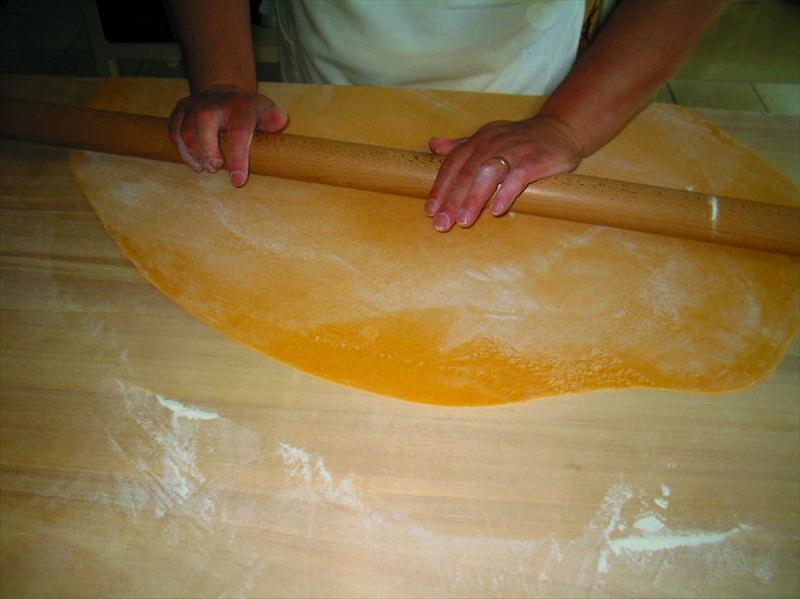 Then, using long rolling pins, they rolled out the dough into huge sheets, 3 to 4 feet in diameter, and as thick as that day’s pasta required. The sheets would be laid somewhere to dry a bit before being folded repeatedly upon themselves to make sfoglia, which was then cut by hand with a sharp knife. It was the width of the noodle that determined the pasta — i.e., extremely thin: capellini (angel hair); somewhat thicker: spaghetti; a little thicker: trenette; a shade thicker: linguine; thicker still: fettuccine; etc. I think you get the idea. For generations, this is how pasta was made and our house was no different. I have fond memories of the women of the house wielding their rolling pins; of wheels of dough drying on floured sheets covering tabletops, beds, and even the backs of chairs; of the family dog being banished while the dough dried; and, of the sound of Mom’s knife quickly cutting perfectly sized linguine, while holding a conversation with one of us or whomever entered her kitchen — and it was her kitchen. Then, about the time I entered high school, everything changed. 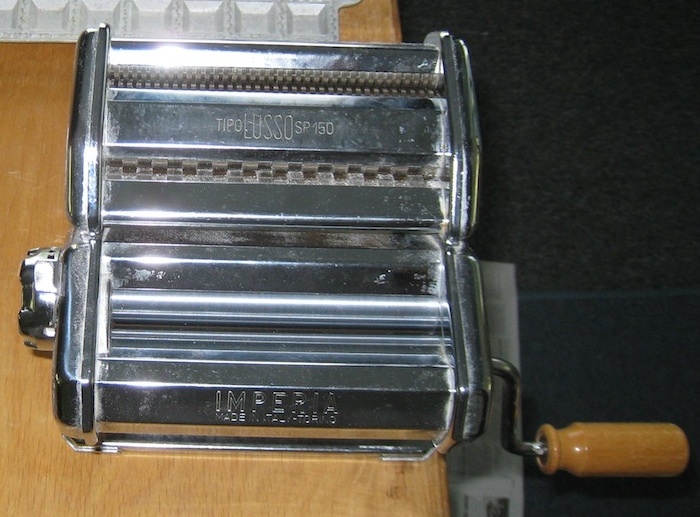 Our family’s first pasta machine was purchased. Although relatively commonplace now, I’ve no idea how widespread their use was in the late 1960’s. I do know that Mom got her machine first and that things changed from that day forward. Mom’s long rolling-pin was all but retired. (She gave it to me a few years before she died.) Instead of round wheels of dough drying around the house, there were now strips of dough — and far fewer of them. You see, if you didn’t have to hand-roll the dough, you could do it more often and make less when you did. More change was to come when my sister and I bought Mom a food processor. Gone were the flour mounds and volcanoes, replaced by a 30 second whirl in this beauty built by Cuisinart. 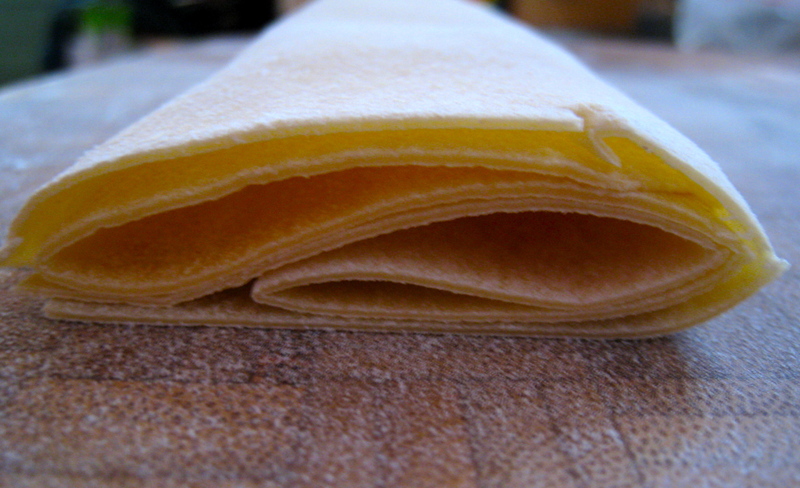 Pasta dough recipes abound on the internet. Just google “pasta dough recipe” and you’ll see what I mean. The one constant that all of the recipes share is that there is nothing exact about making pasta dough. For starters, not all “Grade A Large” eggs are created equal; some are larger than others. As for the flour, not only do you have to contend with differences between the kinds of flour, things like humidity and how you measure it will affect your dough, as well. These things may seem minor but you have to remember that as little as a tablespoon of liquid can make your dough too wet or, if it’s lacking, too dry. This recipe was given to Mom by long-time family friend, Emilia, who had converted a few recipes for preparation using a food processor. (“Milia” and her husband were my brother’s god-parents.) I follow this recipe because it uses a specific amount of liquid, thereby removing any variance resulting from eggs of differing sizes. Though flour-related variables may remain, at least we’re using a constant amount of liquid. Beyond that, one thing is certain: when making pasta dough, experience is the most important ingredient. This post will only cover making pasta dough. Future posts will detail its uses. 4 whole large eggs + enough water to equal 1 cup of liquid. Egg should be allowed to sit on a counter for about 30 minutes before use. Place all ingredients in food processor and mix until a ball of dough forms, about 30 seconds. Place dough on floured work surface. Dough should not be stick to your fingers but should be moist enough to form a cohesive ball. Begin kneading the dough, adding flour or water, in small amounts, as required. Knead until a smooth dough is achieved, at least 5 minutes. The longer you knead the dough, the better the pasta’s texture will be. Cover with plastic wrap and set aside for at least 15 minutes or up to an hour. If dough is to be rested longer than an hour, place it in the refrigerator. When removed from the refrigerator, temper the dough by leaving it on a counter for 30 minutes before using. I prefer to add a pinch of salt and a dash (about 1/8 tsp) of olive oil to my pasta dough. For green (verde) noodles, mix a couple of tablespoons of finely chopped spinach with the flour before adding the egg liquid to the food processor. Zia recalls that, years ago, they used spinach baby food when making pasta verde. This entry was posted in Family Recipes, Home-Made Pastas, Make It Yourself, Vegetarian and tagged Food, Italian, Pasta, Recipes by ChgoJohn. Bookmark the permalink. Nice to have the moisture amount calibrated. My grandmother was from Illinois and handrolled egg noodles and I always remember them hanging and drying. Thanks for the good memory of my childhood. You are so right. It is such an easy thing to do, measure the liquids, but it takes so much of the guess work out of making pasta dough.Those childhood memories are so special, aren’t they? Fantastic – great to have a recipe with measurements that works in the food processor! Hurrah for Milia! Milia was a very special woman, my brother’s God-Mother. She taught my Mom many of the Sammarinese dishes that my Dad loved. Once Mom gave me the food processor recipe, I became serious about making pasta. There was no need to guess about both, how much flour and how many eggs, to use. My dough became much more consistent. A convert! Well, this recipe certainly is easy enough to follow and the results are consistent. Like anything else, though, practice makes perfect. Even with a 30 minute rest for the dough, I can make a batch of pasta in under an hour. That certainly wasn’t the case when I began. I hope he’s successful enough to keep trying. There just is no comparison to the taste and texture of home-made pasta. Yup.. thats the one.. this will work in lasagne won’t it? Oh, yeah! You can make it as thick as you like and that can change the dish’s emphasis from the pasta to the filling & sauce. It’s been a couple years but now I use only home-made pasta for my lasagne. If you’ve got the time, it’s the only way to fly. That is a good one. I’ve a friend who says that my lasagna noodles are more like pastry. Somewhere Mom is smiling. Yes, for us pasta makers, getting a set amount of liquid to use is heaven-sent. There will always be variances in the flour due to the humidity or just to make life a little more difficult but, with the cup measure of liquid, at least half of the variables are removed. Thanks, Colline, for dropping by and taking the time to comment. Hi, I can’t wait to try this. My 86 year old mother always made pasta dough so fast that we never caught on to the amounts. Now she doesn’t ever remember making pasta (sadly) so I am going to try this one. One thing she did do when she finally got her processor was to use the kneader attachment to do her kneading in the processor. Do you suggest that or have you ever tried it that way? I don’t mind kneading it but am just wondering. Thanks for dropping by and good luck making pasta! PS I found your Blog looking for quadretti , Mamma called them quadrettini. I’ve bookemarked it and will visit often. Now that the dough is made, I’m sure you’ll have no problem making the actual pasta. You go, Giovanna! This looks so temptingly easy. My food processor is still sitting on the counter after last nights spinach pesto…. What do you think about using the dough hook on a stand mixer to knead the pasta? I’ve always used my food processor or made dough the old fashioned way, starting with a mound of flour on a pasta board. 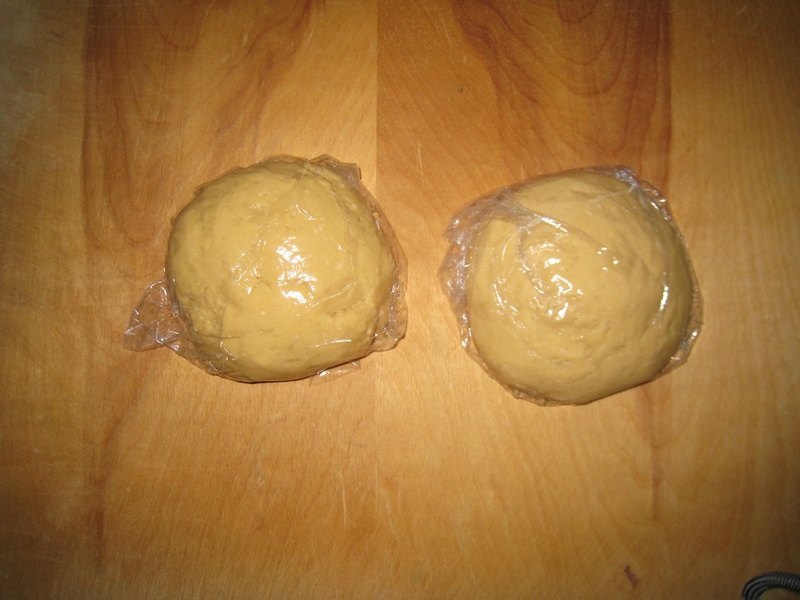 A blogging buddy, Stefan, has a post in which he makes dough using his stand mixer. He uses a semolina flour, though, and we use all-purpose. Even so, the process would be the same. You can see how he does it HERE. The main points are to start with the paddle, add the flour gradually to the eggs, and switch to the dough hook. I hope this helps. 🙂 That will definitely work. Just remember that when you’re done kneading, cover/wrap the dough and let it rest for at least 20 minutes before rolling it out. Good luck! I did it! Squid ink fettuccine alla ChgoJohn. I did skip the food processor and mix everything in the stand mixer with a dough hook just cuz I wasn’t sure what the squid ink would do to the dough since it’s salty and a little oily and I thought I could watch over it better that way. Otherwise I followed your very clear and easy directions. I’m fairly certain that you could even teach my pooch (dew claws and all) to make pasta. So easy and delicious. Thanks! YAY!!! I am so glad you made your own fettuccine. The whole purpose of this blog was to save my family’s recipes for future generations and so that they would be used again. I think of it as a bit of a success every time someone uses one and is happy with the result. Thank you so much for giving it a try and for taking the time to come back and tell me. You’ve made my night! Really! Pasta Perfection John! A great recipe with fabulous instructions and tips to follow – thanks so much! I’ll be making fresh pasta for the family much more often now that we’ve had this little taste of how good fresh pasta can be! 🙂 Hope you’re having a wonderful weekend! I just followed the link in your post for Agnolotti del Plin & I was so glad to see the pingback to your mother’s recipe for pasta dough! Not too long ago I made pasta with one of my granddaughter’s. It was a lot of fun! But I want to try this recipe next time! O M G – I am so jealous!! For so many reasons!! How awesome that you and Celi got together to make ravioli. I had no idea you guys were within driving distance of each other. What a fabulous day you all must have had. And – I forgot to tell you that I DID you use this recipe with my granddaughter, about two years ago to make linguine . IT WAS AWESOME!! As you probably have noticed, I haven’t posted in ages… I was sooo busy with getting my big yellow farmhouse, barn and property ready for sale. What a lot of work. We puts tons of nice things down the bottom of the hill, which has become a busy street in these last 12 years. People were pretty darn happy. One lady told me she was helping her daughter furnish her new apartment with my stuff. In any event – I’m now in St. Augustine. I LOVE IT HERE!! My furniture comes in 9 days… so right now I a sofa and love seat which I purchased here, so it’s my TV watching place, reading place & sleeping place. I bought a toaster oven and a few things to cook with… so I’m doing fine! If you get a spare second, look up Vista Cove – St. Augustine. That’s the complex I live in. I’m very happy – but now I have to get back to blogging! !